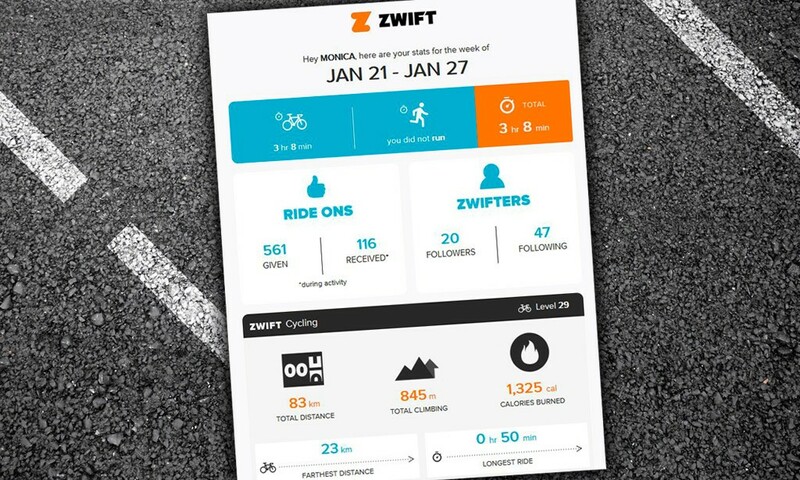 Zwift recently rolled out a fun new feature I didn’t even know I wanted… the “Your Week On Zwift” email! 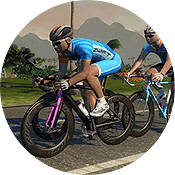 Each week they’re telling us our overall progress for the week: hours spent on Zwift, number of Ride Ons given and received, number of new Zwifters we started following and started following us, total distance, total climbing, total calories burned, farthest distance and longest ride. The first week I got it, the email said I had given 579 Ride Ons! Apparently, I’m a really friendly Zwifter! How did I hand out so many? 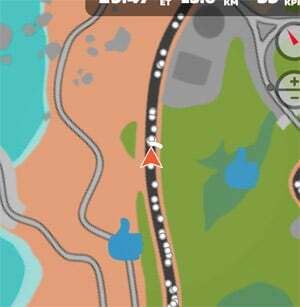 I generally will pop on to the Zwift Companion App when I’m bored and give them out here and there. What’s more important? Friendship? Or Distance? I kept that Ride On number in my head so that I could try to give more the following week. I think it must have stuck a little too well as I ended up riding less the next week. It seems I should have had the goal of riding a longer distance or burning more calories as all of those decreased. Whoops! Technically I still hit my goal of 80km but, well… I always enjoy knowing I’ve made improvements. This week I’ve already ridden a longer ride than the 50 minutes of the week before, so one goal met! Why did ZHQ start sending these emails? Jonathan went on to add that they keep a close eye on email replies as well as other areas people may express an opinion. They enjoy the feedback and are always working to improve our experience. 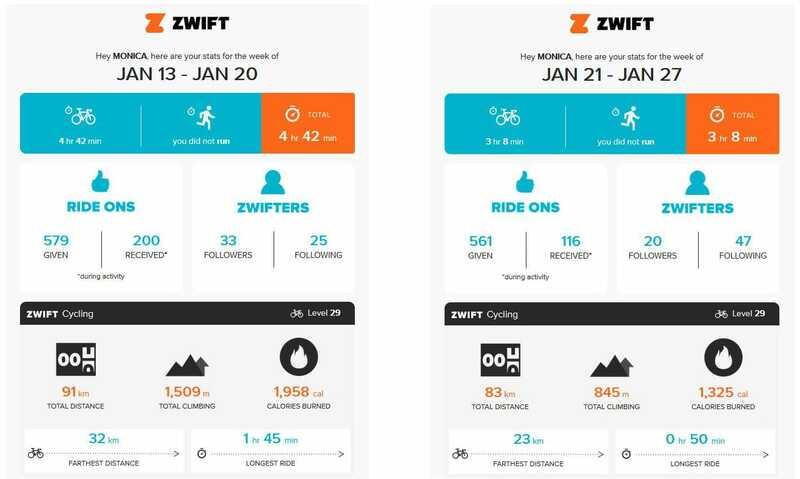 What numbers are standing out to you on your own “Your Week On Zwift?” Which ones are you going to work on? Which one surprised you the most? They havnt reached Australia yet with that feature, must be coming by ship. Not getting these emails, how do you sigh up? I got my first 6 days ago so I expect another tomorrow. A good feature . Can you opt out? I don’t need yet another junk email. I know what training I’ve done each week. Maybe monthly I can understand (like the Strava monthly round-up) but weekly is a bit much. Interesting stats though I guess. Yes, you can opt out by following the link in the recap email. My recent stats were reported a bit low… (missing roughly 2 hours of riding Zwift). I rode the Gran Fondo yesterday and the email acknowledges this with the mention of the 100 Clicks badge. Yet it says my total distance is 31km! ?